On February 25, we released XtremePDFConverter Version 3.0. In this article, you will learn all about this new PDF conversion VCL component. A typical PDF page looks rich in formatted content. Internally, though, PDF does not support formatting features such as paragraphs, tables, or sections. 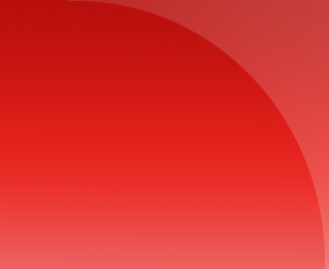 A PDF page contains individual strands of text, shapes, images, and other page elements placed in a 2-D surface. A PDF document has no information about logical organization of content that is typically associated with documents created by word processing programs. For example, a few closely-placed lines of text in a PDF page may look like a paragraph to a human but internally they are just a few lines of text with nothing connecting them. Empty or white space on the edges of a page may look like margins but they are just parts of the PDF page that have no visible elements. PDF was built this way so that documents could retain absolute appearance fidelity in any resolution, device, or platform. PDF is also a final-form document format and is not meant for documents that need to be reused again. However, real-world situations require that PDF documents be converted back to a more usable and editable format. That's where XtremePDFConverter comes in. 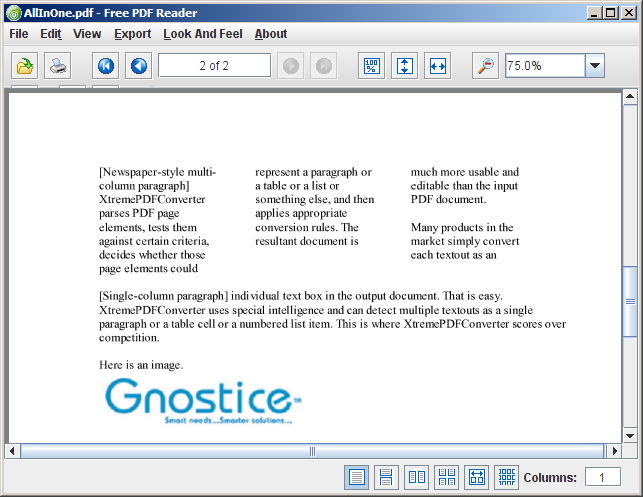 XtremePDFConverter uses an artificial intelligence-based approach to convert PDF to free-flowing, easily editable Word RTF documents. If required, your code can intercept XtremePDFConverter's conversion events and interact with the conversion process. 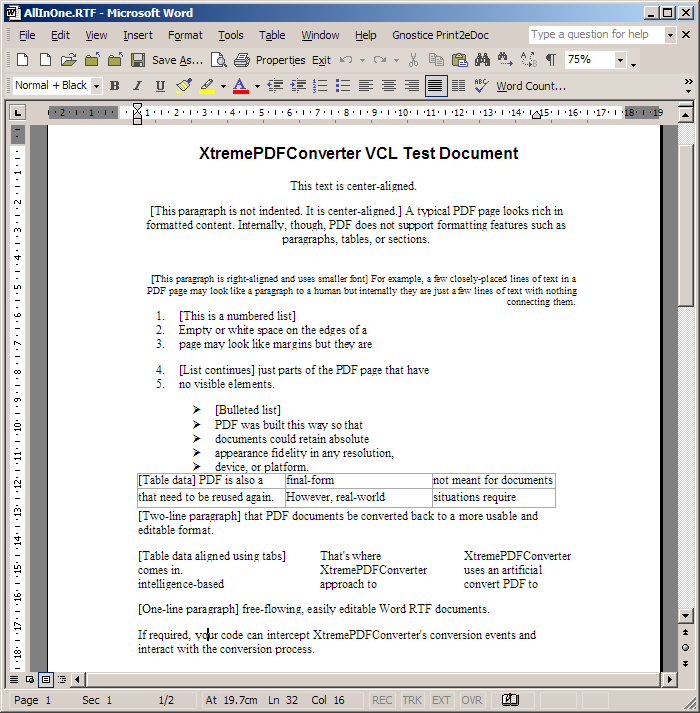 XtremePDFConverter parses PDF page elements, tests them against certain criteria, decides whether those page elements could represent a paragraph or a table or a list or something else, and then applies appropriate conversion rules. The resultant document is much more usable and editable than the input PDF document. Many products in the market simply convert each textout as an individual text box in the output document. That is easy. XtremePDFConverter uses special intelligence and can detect multiple textouts as a single paragraph or a table cell or a numbered list item. This is where XtremePDFConverter scores over competition. Several overloads to perform conversion job by setting the input and output documents with disk files or streams. Inspecting input file page count. Specifying how elements in the output need to be formatted, for example, real tables or tab-formatted columns. For this article, we used a PDF document that would adequately demonstrate all the features of XtremePDFConverter. First, we created a Word DOC file in Microsoft Word. Next, we printed it to PDF using Print2eDoc. 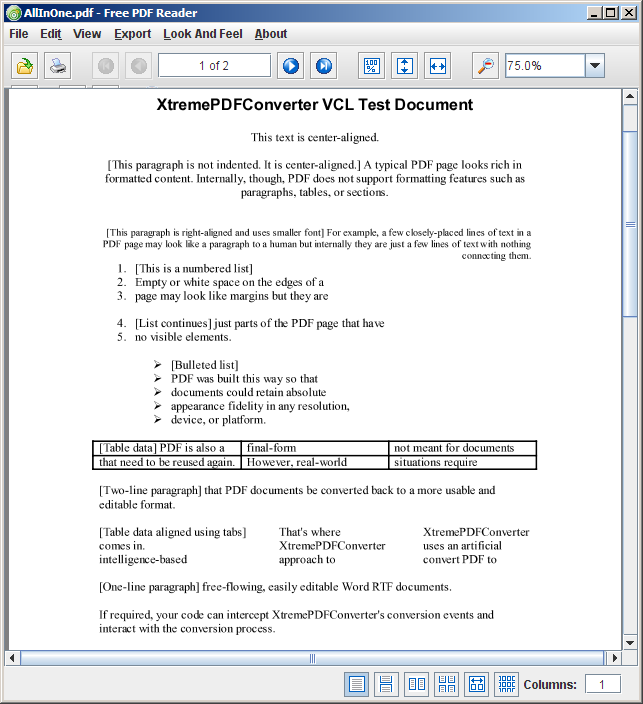 This output PDF document was then used as input with an XtremePDFConverter demo application. 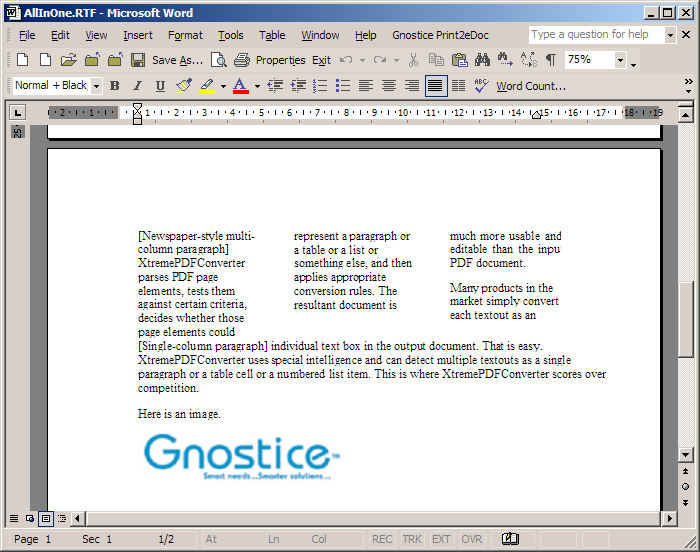 Here is a screenshot of page 1 of the input PDF document, as displayed in our Free PDF Reader desktop application. This is page 2 of the PDF document. Here is page 1 of the the output Word RTF document. And, here is the second page of the output document. You can buy XtremePDFConverter individually or get it as part of our all-Delphi-tools-included XtremeDevSystem Delphi Universal Subscription. If you buy the subscription, source code is included.